When we talk about expensive and luxurious pools, we immediately start recollected our best hotel pool experiences or the great time we had at a swanky water park. Undoubtedly pools that are fun can be impressive, but they are in no way close to some of the most exquisitely designed and conceptualized expensive pools of the world that are a multi-million dollar investment. Such pools can be found at private residences and resorts and the best part is that some of them can be used by the general public that enables the masses to get an out-of-the-world experience in the spectacular pool. Off late, these high end pools have become destinations in themselves and are now being promoted by the resort owners and developers who seek to convert them into new world tourist attractions. This is definitely a good way to make up for all the dollars spent and gain on the profits too! What keeps people wondering is the reason why these pools boast of a multimillion dollar price tag- the answer to this is that these pools have been built with exclusive technology, luxurious raw materials and sophisticated features such as extravagant water slides and fountains that place them notches above other pools. There are so many intricate details that are incorporated in the pool and that is what leads to their staggering budgets. Here are five of the most expensive pool designs in the world: Gellert Thermal Baths The Gellert Thermal Baths is perhaps the oldest and the most popular public bathhouses in the world that is located in the historic city of Budapest in Hungary. This bathhouse was built between 1912-18 and is still functional. The Baths are preserved with great care and is a fine work of Art Noveau architecture of its times. The pool’s dimensions are 700 square meters and it is fed by over 100 hot mineral springs. The Baths are open to general public at a nominal fee. Umaid Bhawan Palace The Umaid Bhawan Palace is located in India and the building is part royal residence and the remaining has been converted into a heritage hotel. The Umaid Bhawan Palace was built in 1943 and it took over $225,000 dollars to construct the palace and 15 years of laborious work. The most significant feature of the palace is the pool that is located under the center of the building called the ‘Zodiac’. The pool has a classic Art Deco style and is circular in shape with mosaic tiles that depict the various sings of the Zodiac. At present, guests at the hotel can enjoy a swim in this heritage pool along with the royalties of the palace who still live there. Sarojin Resort The Sarojin Resort is located in Thailand and is perhaps the most extravagant hotel pools around the globe. It is located near Phuket and has been the recipient of multiple World Travel Awards. The resort opened its doors in 2004 and was unfortunately destroyed by the Tsunami, however, it was rebuilt and has been successful in drawing back tourists to its region. The Infinity Pool of the Sarojin overlooks the vast expanses of the Indian Ocean and provides ultimate luxury and spectacular views. Kitchukov Family Pool The Kitchukov family has a luxurious private pool in their home that is located in Gilbert, Arizona (US). The pool is the expensive private home pool by far and was constructed by Red Rock Contractors, having a size that is ten times bigger than any regular pool in the backyard. The pool cost a whopping 1 million dollars and took five months to construct with its various features like a fountain, waterfalls and a waterslide. The pool also has an innovative ScreenLogic interface system which allows it to operate the pool from anywhere with the help of a button. City of Stars Crystal Lagoons are prominent builders who are utilizing their patented filtering technology to construct an extravagant high-end pool in their latest project called ‘City of Stars resort’ in Cairo, Egypt. The pool would be extremely huge in dimensions to the extent that one can even sail a boat there. 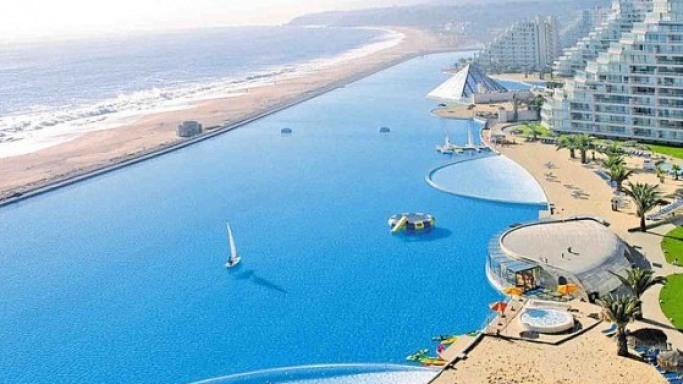 The Soma Bay pool would cost more than 5.5 billion dollars and would feature 18 lagoons that are interconnected over an expanse of more than 30 acres!